Not great news, Planeswalker. It was always kind of easy to not take Nicol Bolas too seriously. I mean, he popped up on seemingly random worlds doing seemingly random things. An army of dead worshippers? That sun thing? A bridge? But the endgame is here, and the War of the Spark is upon us. This may be the end for Ravnica and much more. But we're not going out without some great cards and mechanics. Let's review what's to come. Although not a named mechanic, per se, Planeswalkers are clearly the stars of this show. There are an unprecedented number of planeswalkers in War of the Spark, and players will undoubtedly encounter them in more Booster Draft and Sealed Deck games than ever before. In recent history, planeswalkers have only appeared at mythic rare, so even if you're a seasoned veteran, you might have run into them only sparingly. The uncommon planeswalkers have only two abilities, and neither of them increases loyalty. 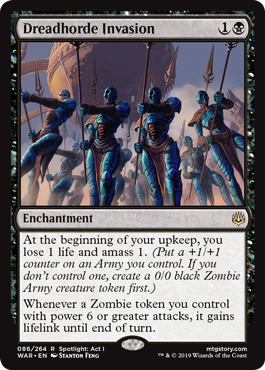 Unless you find some other way to increase their loyalty (see "Proliferate," below), these planeswalkers may have a small amount of time on the battlefield. In fact, every planeswalker in this set has an ability that doesn't involve loyalty at all. It could be a static ability. 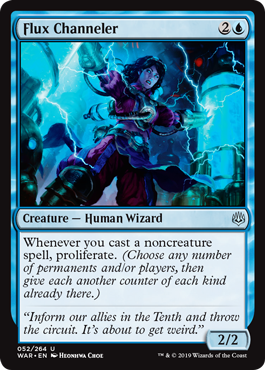 These abilities are always "on," functioning no matter whose turn it is and no matter if you've activated any of that planeswalker's loyalty abilities. 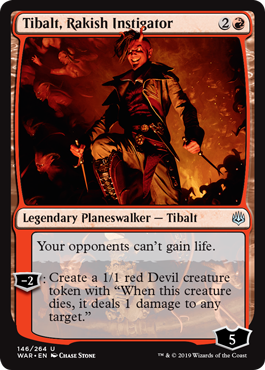 Tibalt shuts down life gain as long as he's on the battlefield. It could also be a triggered ability. 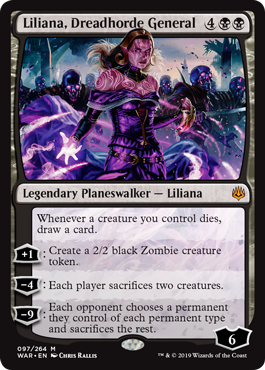 These abilities trigger whenever their condition is met, again no matter whose turn it is and no matter if you've activated any of that planeswalker's loyalty abilities. Liliana is happy to convert your dead into new cards, day or night. The rules governing planeswalkers haven't changed in this set. If you can get an opposing planeswalker to 0 loyalty, it will be put into its owner's graveyard. Damage dealt to planeswalkers causes them to lose loyalty. You can attack them with your creatures. If you do, your opponents can block as normal. Some spells that deal damage may be able to target or otherwise hit planeswalkers. If a spell or ability says "any target," it can target a creature, player, or planeswalker. War of the Spark features one prominent returning keyword: proliferate. Some fans may recall proliferate as a tool that spread destruction and decay. It was a Phyrexian innovation, after all. 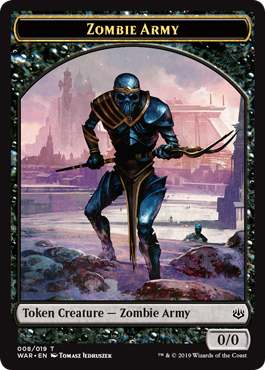 With all the planeswalkers and +1/+1 counters bouncing around, proliferate stands ready to serve a slightly different role in this war. To proliferate, choose any number of players or permanents that have one or more counters on them. This can be any kind of counters: +1/+1 counters on creatures, loyalty counters on planeswalkers, even unusual things like time, charge, or doom counters. Counters that players get—including energy, experience, and poison—are all fair game. For each of the chosen players or permanents, give it another counter of the same kind it already had. Remember that when you proliferate, you only put counters on the players and/or permanents you want to. If a creature your opponent controls has a +1/+1 counter, you can proliferate without fear of pumping it up. There has been one small tweak to the proliferate rules this time around. Previously, if a player or permanent had more than one kind of counter, you'd choose one to add. Now, you just get all of them. Although unusual, this is most likely to happen with players. Say one of your opponents has both an energy counter and a poison counter. 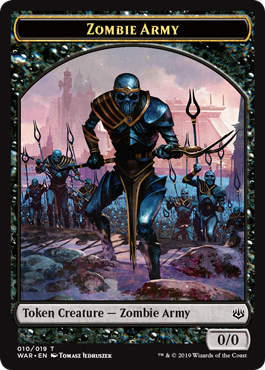 If someone proliferates, they will get both counters (one of each) or they'll get neither, depending if the player who proliferated chose to include them. War of the Spark rolls on. Is it the beginning of the end? To be determined. 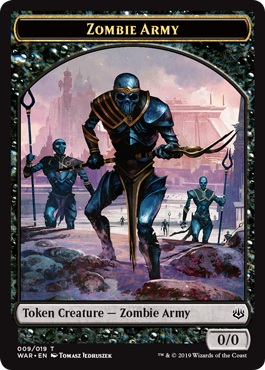 Is it the beginning of lots of cool new cards that can spice up existing decks and be the cornerstones of new ones? Absolutely. Stay tuned to this site and all our allies as reports from the front continue to roll in.